This unit is E100 completely remodeled in 2008. Granite counters in kitchen & bath, 50 in plasma Smart TV in family room and separate tv in master bedroom FREE HBO Channels, and, wood floors, beautiful ocean views and pool view, boogie boards, skin boards, towels, umbrella, chairs, sand toys, leather sofa which has a comfortable queen sleeper sofa. Stainless steel appliances. Table with 4 chairs, refrig with water & ice maker microwave, stove & oven. We are married and have 3 grown children and we just love to share our beautiful seaside retreat. We love to walk and ride bikes up and down the coast and love to watch the seals in the harbor. We fell in love with this property because of the location of the unit and the view we had from our balcony. We love to sit out on the balcony and see over the beautiful pool and the ocean. 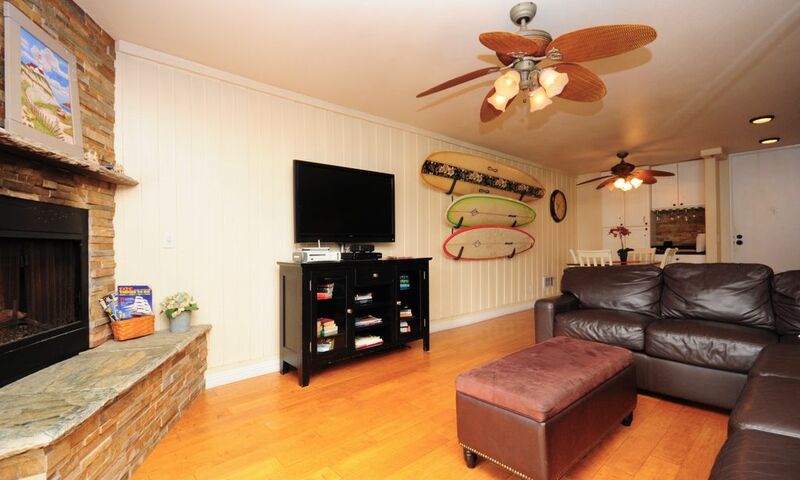 We completely remodeled our unit we love the bamboo floors and the sounds of the waves from our unit. sink is separate from tub and toilet with shampoo and conditioner and soap. Northcoast Village is a oceanfront complex you have many different buildings within the complex. I am on the E building which is next door to the open front buildings. Living room has leather sofa with big screen tv and fireplace and some movies channels with a smart tv which includes netflix and Roku. There is also a big screen tv in master bedroom with cable. With every rental I give a complimentary bottle of Wine red or white with complimentary snacks. Wasn’t a bad place to stay, owners seemed nice, condo was supplied well. The pool was freezing, we’re from Alaska and my son said coldest pool he has been in, jacuzzi was not currently working. Lol ducks swam in the pool, didn’t notice many people going to the pool otherwise. I guess just not what we were expecting, Carlsbad just a nicer area to stay. This place really had everything we needed! It was very clean and beautiful inside! The views from the balcony were stunning! I will definitely be staying here again!! The owners were very helpful as well! Great place, great owners, AMAZING TIME! View are amazing from patio! Plenty towels and kitchen nicely load. Only one draw back shower curtain was totally rusted out. This is my favorite condo at North Coast Village! I love staying here. It is a beautiful condo with all the amenities that are needed! Owner is gracious and helpful with anything you need. I will stay here again and again. Booking the condo, arriving and checking in, the stay, the checkout process - were all as easy as could be. Great condo, well cared for and clean. Excellent location within the complex with easy access to pool and beach. We will stay again! It was our second time staying at this condo we really love it, it’s comfortable and cozy. It has everything we need from towels and linens to games and everything we need at the beach. We will definitely stay there again and recommend it to family and friends. The location is right on the beach you are right next to the Harbor with many restaurants,shops and fishing excursions.